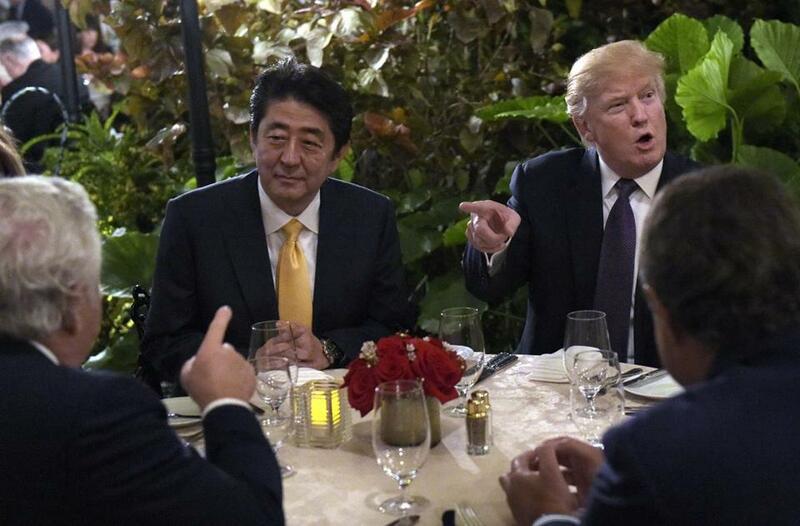 President Trump sat at dinner with Japanese Prime Minister Shinzo Abe at Mar-a-Lago in Palm Beach, Fla., on Feb. 10. WASHINGTON — When Donald Trump meets with Chinese leader Xi Jinping at the president’s exclusive Mar-a-Lago club in Florida Thursday, the scene will be scrutinized by diplomats, foreign policy specialists, and the media for clues on how two of the world’s most important leaders get along. The backdrop will serve another purpose: giving the American president his highest-profile event yet to show off his for-profit private club and crystallizing how Trump is transforming the American presidency by merging international diplomacy, politics, and free-media marketing for his business empire. Trump’s White House says the president wants Xi to feel comfortable for high-level talks in the relaxed environs of his Palm Beach club, a crown jewel in Trump’s global array of holdings. But to Trump’s harshest critics, the scene reeks of a corrupt blending of public power, personal profit, and undue access for wealthy club members. Xi will be the second foreign head of state to visit Mar-a-Lago during Trump’s administration. 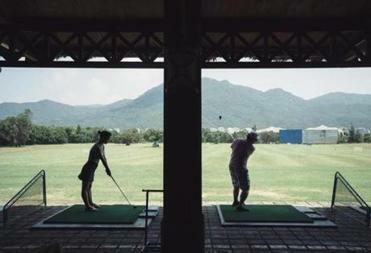 His trip comes seven weeks after Prime Minister Shinzo Abe of Japan spent a night at the resort, a visit that was well documented on social media when club members snapped and posted photos of the two leaders. There’s a long history of presidents entertaining foreign leaders outside of the Beltway, from the Bushes opening up Walker Point in Maine to Ronald Reagan hosting the British royals at his California ranch. What’s new here is Trump using the opportunities of a diplomatic summit to elevate a business that financially benefits the president and his family. In China, the game has become a symbol of capitalist excesses and corruption in the eyes of the Communist Party. Mary Mel French, who was the chief protocol officer during the Clinton administration, contended that presidents can get more substantive work done in Washington. Some foreign policy experts say the chance to improve relations with China is more important than whatever ancillary profit motive the president may harbor. “I’m very skeptical about Trump and his foreign policy, but this doesn’t bother me that much,” said Joseph Nye, a professor at Harvard’s Kennedy School of Government who served in foreign policy posts under Democratic administrations. Nye said that a formal visit by a head of state to Washington can be weighed down by the necessary rituals that an official visit entails. There is substantial work to be done. Trump based a large part of his 2016 campaign on promises to rein in China’s expansionist economic vision and vows to crack down what he called Chinese trade abuses. “It’s a place where he feels comfortable and at home and where he can break the ice with Xi Jinping without the formality, really, of a Washington meet up,” said a senior administration official in a background briefing to reporters. Melania Trump along with Peng Liyuan, the wife of China’s leader, will be at the club during the visit. Thursday includes time for the couples to “get to know one another” along with a dinner, said the official. On Friday they’ve planned a series of meetings and a working lunch. Xi does not golf, so there’s no time on the links in the plan. Trump spent about three hours on the fairway with Abe when he visited in February. Other American presidents enjoyed entertaining world leaders away from the White House, and the photos from these events similarly reinforced the image that each president wanted to convey. Ronald Reagan reveled in playing the cowboy when he hosted leaders including Queen Elizabeth and Prince Philip at Rancho del Cielo in Southern California. He fed the royals tacos and dressed down in “ranch jacket and western-style tie and boots,” according to a New York Times account of the 1983 visit. George H.W. Bush paraded a series of leaders including President Francois Mitterrand of France through his Kennebunkport compound in Maine, leveraging his preppy elite status in the service of foreign policy goals. His son carried on the family tradition. President George W. Bush hosted 18 foreign leaders at his Crawford, Texas, ranch. A testament to the informality came when the president’s dog Barney meandered into a press conference Bush held with Prime Minister John Howard of Australia. But there’s a key distinction between places such as Crawford and Mar-a-Lago. Presidents Clinton and Obama didn’t have massive family estates, so would use established government retreats including Camp David, the official presidential retreat in Maryland. Obama met with Xi at Sunnylands, the former Annenberg Estate in California that has recently been set aside for presidents to use. Trump has shown zero interest in either place. He hasn’t visited Camp David, which is nestled in a forest a short helicopter ride away from the South Lawn. While steeped in history, Camp David, with its scattering of rustic cabins, horseshoe pit, and single golf hole, occupies the opposite end of the recreational spectrum from Mar-a-Lago and Trump’s other glitzy resorts. Mar-a-Lago was originally intended to be a “Southern White House,” after it was built by Marjorie Merriweather Post in the 1920s. She left the estate to the federal government when she died in 1973. Then, under the Carter administration, the estate was put up for sale because the federal government didn’t want to pay the upkeep costs. For foreign leaders, a sojourn at Mar-a-Lago conveys a sense that Trump values the relationship, so it’s a win for them, according to foreign policy experts. Abe of Japan was widely seen to have benefited from being so physically close to Trump, especially when nearby guests posted photos on social media showing the leaders and their aides conferring after North Korea test fired missiles. During the upcoming meeting with Xi, members of Mar-a-Lago have been told that the Chinese delegation won’t be mixing with guests, according to a club member who didn’t want to be named. “They get a controlled media environment; they don’t get that in Washington,” said Ely Ratner, a senior fellow in China studies at the Council on Foreign Relations and former national security adviser to Vice President Joe Biden. But, in his view, China has done nothing to deserve such a treat. “It’s a big mistake to be hosting Xi at Mar-a-Lago,” Ratner said. He said it gives Xi a “massive stamp of legitimacy” to his domestic audience just months before he goes into a leadership conclave, which comes once every five years. “They should have had the opening meeting in Washington and said we can do the Mar-a-Lago meeting, but you have to earn it,” he said. A senior Trump administration official sounded optimistic that the United States would be getting something in return for the intimate hospitality. “At the end of the summit, I think you’ll get a pretty good read out of what was discussed and what the path is forward for resolving a lot of those contentious issues that are near and dear to the president’s heart and are issues that helped get him elected,” said the administration official, when asked what the United States got in return for the intimate setting. Annie Linskey can be reached at annie.linskey@globe.com. Correction: Due to a reporting error, an earlier version of this article inaccurately identified Queen Elizabeth’s husband. He is Prince Philip.